5/1 Cup of Coffee: All four Red Sox minor league affiliates came away with wins, including walk-off heroics by Bryce Brentz in Pawtucket and Michael Chavis in Greenville. 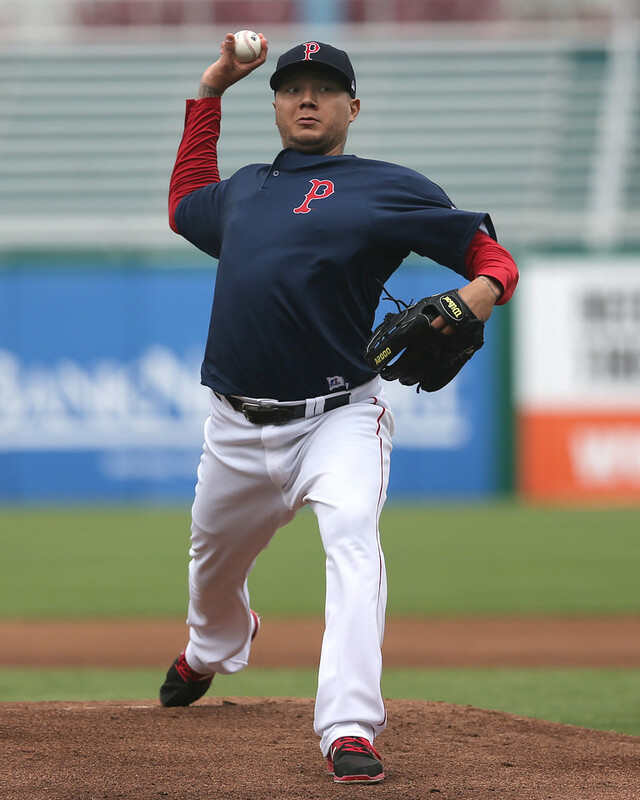 Hector Velazquez (pictured) excelled for Pawtucket, throwing six perfect innings, and Jalen Beeks tossed seven shutout innings for Portland. Logan Boyd earned the win with six innings of one-run ball for the Drive. Bryce Brentz sent the PawSox fans home happy with a two-run walk-off homer on Sunday afternoon. Brentz's fourth blast of the season capped a phenomenal pitching duel between Hector Velazquez and Braves southpaw Sean Newcomb, ranked as the 78th best prospect in baseball by Baseball America. Velazquez threw six perfect innings, striking out four, while Newcomb struck out eleven in 7 1/3 one-hit innings. Edgar Olmos tossed two perfect frames, striking out three, and Robbie Ross Jr. picked up the save with a shutout inning. The Sea Dogs also received an excellent starting pitching performance, with Jalen Beeks turning in seven shutout innings. The left-hander allowed three hits and three walks while fanning four to lower his ERA to 1.99 in 22 2/3 innings. Austin Maddox and Jamie Callahan each threw a scoreless inning in relief. Jake DePew drove in Tzu-Wei Lin with a single in the seventh inning for the only run of the game. Right fielder Cole Sturgeon was 4 for 4. Salem also emerged on Sunday with a walk-off win, completing their comeback with an RBI double by Michael Chavis in the bottom of the ninth. Tate Matheny and Jose Sermo each provided single runs with solo home runs in the third and sixth innings, respectively. Kyri Washington was 3 for 4 with an RBI single in the eighth. Daniel McGrath started the game on the mound, allowing three unearned runs across five innings. In relief, Gerson Bautista allowed a run in two innings and Adam Lau threw two scoreless. Logan Boyd threw six strong innings on Sunday afternoon, allowing a run on three hits to pick up the win behind an eight-run performance by the lineup. Yoan Aybar was 2 for 5 with a double. Roldani Baldwin was 1 for 4 and knocked a two-run double in the seventh inning. Carlos Tovar was 1 for 4 with a triple and a walk from the top of the lineup. Hildemaro Requena tossed two scoreless innings of relief and Dakota Smith allowed two runs in an inning. Player of the Day: Hector Velazquez was untouchable for the PawSox on Sunday, throwing six perfect innings and striking out four batters. Velazquez threw five shutout innings in his previous outing and now has a 1.72 ERA with 13 strikeouts and three walks in 15 2/3 innings this season. The Red Sox signed the 28-year-old Velazquez to a minor league contract out of the Mexican League this offseason.